London Fire Brigade said the cause of the fire in north Kensington is not yet known. Concerns had been raised about the fire risk of cladding as far back as 2000 in a parliamentary report, it has emerged. The Environment, Transport and Regional Affairs Committee launched an inquiry after a blaze tore through a 14-storey block of flats in Irvine, Ayrshire, in June 1999, killing an elderly man. It concluded that cladding should be non-combustible or not pose an unacceptable level of risk to tenants. London Fire Brigade said the cause of Tuesday night’s fire in north Kensington is not yet known. But the parliamentary report said: “We do not believe it should take a serious fire in which many people are killed before all reasonable steps are taken towards minimising the risks. 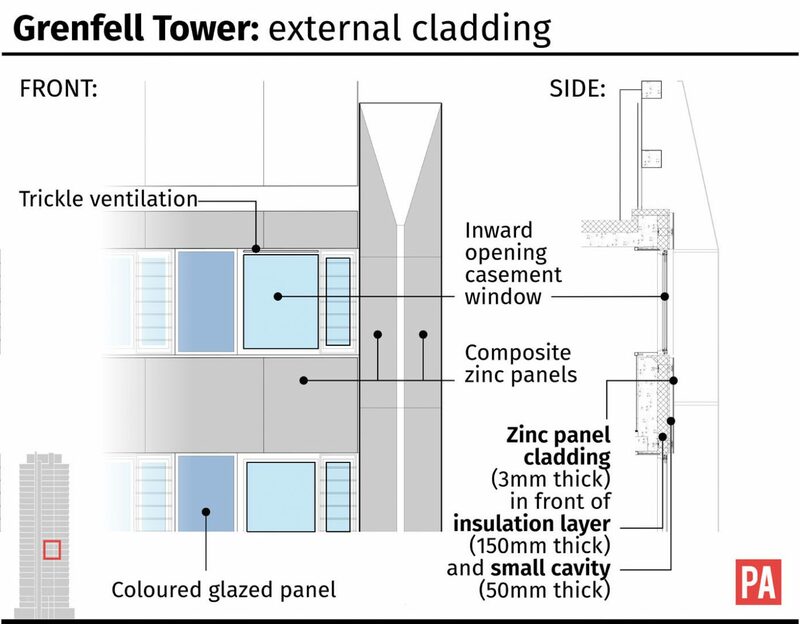 Flammable cladding has been blamed for helping to spread severe fires elsewhere in the world, including a blaze at the Lacrosse tower block in Melbourne, Australia, in 2014. It was caused by a cigarette on an eighth-floor balcony and the quickly spread vertically up the building. An analysis report by the Melbourne Metropolitan Fire Brigade (MFB), which described “many contributory factors”, said the first fire crews on the scene saw that the blaze had already swept up the external walls and balconies over approximately six levels and “only six minutes later, crews reported back that fire had reached the roof of the building above the 21st floor”. Rydon, the firm that carried out the Grenfell Tower refurbishment work, said in a statement following the fire that the project “met all required building regulations”. But a line stating that it met all “fire regulation and health and safety standards”, which was included in an earlier release, had disappeared. Harley Facades Limited (HFL) completed the refurbishment work to Grenfell Tower which included installing the exterior cladding. The company described the Aluminium Composite Material (ACM) panels as a commonly used product and stated that HFL does not make the panels.